@Bryan Thanks for the suggestion. @Paulo27 I see. Hopefully it will be there eventually / asap! Seven seas is being very aggressive with their release schedule on these. They already have Grimgar Vol. 4 up for pre-order with a tenitive release date for December 12, 2107. Puts Yen On! to shame. @ky0n_77 if you use calibre the program you can change the format of the epub files to any other file making them seem identical. Of course if it's the stores library you care more about I understand. But if you simply want the same format calibre can do that for you. Remember that a lot of the process is already effectively done for them. They don't have to secure the licenses, or go through the translation process, or approval for the translation/cover etc. Probably don't have to go through editing either. It really isn't a fair comparison. @kuuderes_shadow yeah I was pretty much just mentioning it here so people who don't surf amazon all day can also go pre-order, that way there are higher pre-order numbers. 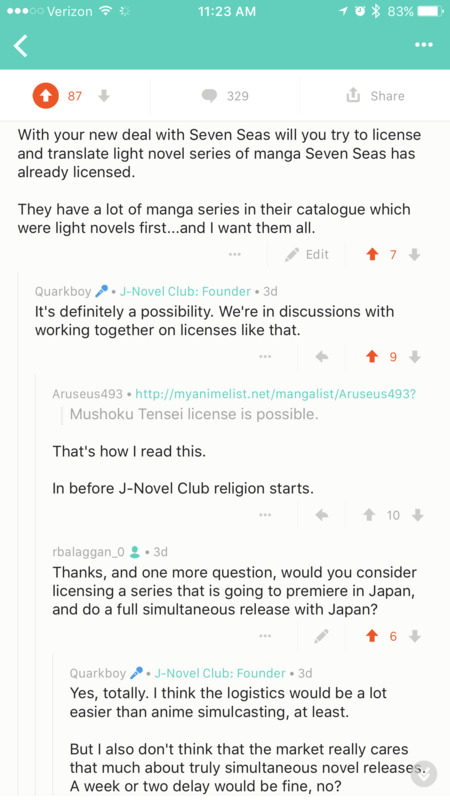 I need to ask: considering this deal, would it be possible for J-Novel to pick up some of the light novels to manga series that Seven Seas has? For example: Seven Seas has the Mushoku Tensei manga, but it doesn't look like they plan to translate the light novel. I might be asking for much, but I'd still like to know if it's a possibility. @Rahul-Balaggan You know what? I SAW that question and answer, and yet, it somehow escaped me entirely. Thanks for reminding me! @ארז-אבני Most of e-books don't have fixed page formatting: you can read it with huge font on a small screen and get thousands of pages or you can put it on a 4K display with tiny font and get only a dozen of pages. What amazon shows as page count is some estimation for some kind of typical page layout so you can compare length of different digital books. Printed books have some different page layout so they have a different page count. Seven Seas print version should have the same exact content except for premium e-books (bought here, not on amazon, kobo, etc) having some bonus illustrations and some different metadata (about, copyright, summary). Print version might also have an extra proofread/edit pass, maybe someone with a print edition can comment on that. @_08 We got a copy of the manuscript from Seven Seas and they fixed a typo or two and maybe edited a couple of paragraphs a little. Other than that identical. I'd be a stretch to say the print was a superior version than the ebook (Aside from it being a physical book).